Join us for a virtual tour into the world of 16 – 25 year olds. Find out how the digital revolution is changing the rules of engagement for all of us. Get the latest audience insights from our innovative data visualisation research. Hear from inspiring speakers about how digital media is opening up new spaces for young people interact with their communities and their world. And take a ringside seat as the major political parties debate the future of youth activism. Find out more on the vinspired website. In 2008, for the first time ever, more Americans relied on the Internet for national and international news than on newspapers. 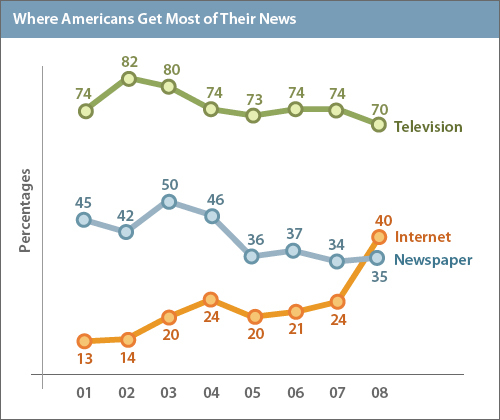 In December 2008, 40% of those surveyed said they get most of their news on the Internet, up from 24% in September 2007. 35% still mainly read newspapers, and 70% say television is their primary source of news. As part of my interview with Christian Aid on Thursday I gave a short presentation on how non-profits can engage with Web 2.0, and why they should. As promised, here are my notes from that presentation… forgive me for the length, but a few of you have been asking about this, so I decided to post the entire set of notes. I’ve also added a few links that might be helpful for you. This is also obviously geared towards Christian Aid, but the same ideas can be applied to most non-profits. Would love to hear your thoughts too? The term Web2.0 is used to indicate an improved form of the web, although there is no exact consensus on its exact meaning. It is a move away from static websites, from using searching engines to find specific pages, to a more dynamic, fluid and interactive world wide web. Innovation and open source projects exemplify web2.0, further reinforcing the current move towards the wisdom of crowds, rather than relying solely on experts. To give you an example of this, using double click is a web1.0 technology – you choose what you want to see. Google Ads is a web2.0 technology, where a computer bot scans your webpage and decides what ads are appropriate for your site. So, why should you care about web2.0? Now is the time to ask how the Web—its technologies, its values, and its culture—might be tapped to address the world’s most pressing limits. The Web can teach us new ways to address these limits. From harnessing collective intelligence to a bias toward open systems, the Web’s greatest inventions are, at their core, social movements. You can be sure that someone is talking about Christian Aid somewhere on the web. What do you want to be your legacy? You need to be leading the conversation on what people are saying about your organisation – that role shouldn’t just go to the loudest or most vocal person. Recently, Rick Warren held a “Purpose Driven Summit” at the church he pastors in California. It was about influence and sharing – sharing what he and others have learned with as many people as possible. He invited 35 pastors to teach on different topics. But he also had people invited specifically to blog and video conversations, interviews and sessions, so that the teaching could be shared as widely as possible. The web was saturated with interviews with speakers, blogged notes from sessions, and reflections on the one day summit. Compassion Bloggers recently launched their website, run by Compassion International. In February this year, Compassion took a group of 15 bloggers to Uganda to witness first hand the impact of sponsorship on a childs life. The team wrote weblogs, took photographs, made videos – did whatever possible to raise awareness among people of the important work of Compassion. Many children received sponsorship because of those blog posts and videos. They are now sending out monthly updates to supporters, encouraging them to blog about a specific topic or need each month. For example, through one blog, over 110 malaria nets were donated in less than 50 hours. Bono once said, “Influence is currency,” and I believe this is an incredible way to spend your influence – on behalf of the poor and oppressed. To Write Love On Her Arms is another movement that is spreading rapidly via the internet. It is a US-based charity focused on suicide prevention and treatment for depression, which began with as an attempt to tell one persons story. It uses internet media such as Youtube and MySpace as well as music to communicate its message that hope is not a myth. Leonard Sweet once commented that “the future belongs to the storytellers and connectors”, and I think TWLOHA shows the truth to that statement. So how do Christian Aid engage with this? Someone commented earlier on your local intranet, and how gapers are sharing ideas and resources across it. Why not make that public, or as much of it as possible? Let campaigners use your ideas, and add to them. It could foster community and solidarity among supporters, as well as adding to your own resource library! Take advantage of Facebook. I noticed the Christian Aid week page, but that was all I saw. In my experience Facebook is rapidly becoming one of the most used websites among the student population, and presents a great opportunity for you to engage with supporters. Maintaining a weblog would enable you to share information such as the latest news at HQ, recent campaigns and links to other resources with the wider population. Blogs are a fantastic way to stimulate and foster dialogue among people who may be geographically far removed, and again are a way to influence culture and lead the conversation on your organisation. It’s also a place to celebrate victories! We should not only be pressing hard for change, but we should celebrate every victory, no matter how small. On a smaller, more dynamic scale, you could also make use of Twitter, a micro-blogging tool. Blogs could also be maintained with information from specific projects, providing a way to sustain conversation and interest in projects that are no longer a media focus. For example, where does the money from Christian Aid week go to? A blog could be a useful tool in sustaining dialogue with supporters, allowing them to see the impact their donations and efforts are having, through words, photographs and videos. Podcasting is now a relatively inexpensive and easy technology to use, and could be used to provide training for supporters. Why not record podcasts that help to explain complex issues like climate change or trade justice? Interviews with Christian Aid staff, partners, Gappers, and supporters could all be recorded, which helps to put a human voice and face on a large organisation.